If it wasn’t for the fact that the default Minecraft character is referred to as “Minecraft Guy” and that I once jokingly answered “Steve?” when asked what his* name was, Minecraft would be a game where gender isn’t a gameplay element. The human model is intended to represent a Human Being. Not a male Human Being or a female Human Being, but simply a Human Being. The blocky shape gives it a bit of a traditional masculine look, but adding a separate female mesh would just make it worse by having one specific model for female Human Beings and male ones. That would force players to make a decisions about gender in a game where gender doesn’t even exist. Also, as a fun side fact, it means every character and animal in Minecraft is homosexual because there’s only one gender to choose from. Take THAT, homophobes! 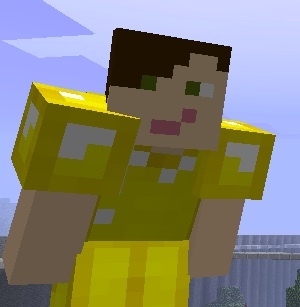 I hope to trouble notions of who determines the gender of players and their avatars, and how the setting in Minecraft is suggestive of an interpretation of Steve’s gender (i.e. why it is, perhaps, no accident that Steve is popularly perceived as a dude). As an aside, it’s equally exciting for me to now know who is also doing research on the game—sometimes the videogame research world seems like a small place. At Oregon, doubly so. I look forward to sharing more about the collection + who is in it as we get closer to publication deadlines.